An integrated washer-dryer, which sits hidden behind your kitchen cupboard, can be a great way to give your kitchen a sleek, unified look. If you’re buying one this Black Friday, read on to get the lowdown on the key things you need to consider beforehand. Or go straight to all our integrated washer-dryer reviews. Integrated machines are limited in size because they have to fit into the space behind your cupboard doors. This means you won’t find one that holds more than an 8kg wash or a 5kg drying load. 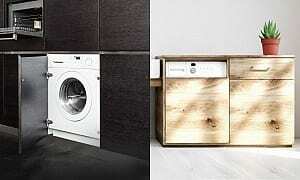 Freestanding machines tend to be bigger, holding up to 4kg more – or around six extra towels. 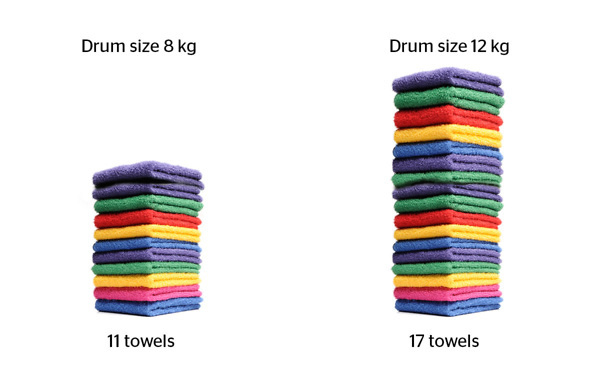 These load sizes mean that the maximum you’ll be able to fit into the wash is around 11 towels, compared with the 17 towels you could load into a bigger, freestanding washer-dryer. It’s unlikely to be an issue if you don’t do much washing, but if you regularly have lots of laundry, an integrated machine might not be for you. An integrated washer-dryer will usually cost you more to buy than its freestanding equivalent. In fact, those who opt for an integrated machine can expect to cough up an extra £124, on average. That’s according to the average current prices from companies who produce both types of machines. There are some more affordable options out there, though, and we’ve tested models priced at less than £400. Integrated models also cost more to fit than freestanding machines. Get more advice on how to measure up for and fit your machine in our guide How to buy the best washer-dryer. Although they may help your kitchen look good, you could find you have to compromise on performance. Among the washer-dryers we’ve tested, integrated machines generally don’t wash or dry as well as freestanding models. At the moment we don’t have any models that have impressed us enough to be named a Best Buy washer-dryer. The highest-scoring integrated machine currently on sale that we’ve tested got a score of 64%, whereas our highest-scoring freestanding washer-dryer scored 75%. Integrated models make up less than a fifth of all washer-dryers on the market, so there are not a lot to choose from. 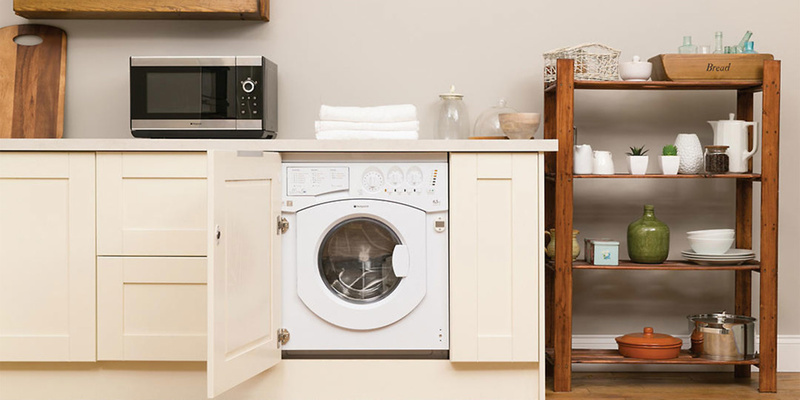 Just 12 of the 83 washer-dryers we’ve reviewed are integrated. The latest model-to-market machine we’ve tested is the AEG L61472WDBI. Integrated washer-dryers can be either fully integrated or semi integrated. Choose a fully integrated model and your washer-dryer will be completely hidden behind the cupboard door. A semi-integrated model, on the other hand, will only be partially hidden. The machine itself will still be concealed behind the kitchen unit, but it will have a space along the top so you can see the display panel – useful for knowing how long you have left on a wash cycle, for example. Fully integrated machines are more common than semi integrated: 90% of washer-dryers fall into this category. Don’t confuse the term ‘built-in with ‘integrated’. Built-in actually means a standard washer-dryer that fits under your units with no door over the machine. You don’t need to buy an integrated washer-dryer if this is what you’re looking for.